Here at ODM we are always looking for new ways to improve brand awareness and increase sales. PG tips have offered a free tea towel as a gift with purchase in the UK. This is a great idea as it will tempt customers to buy your item by providing a everyday use and practical item. The free item has a direct link with the product so it has even more relevance to the customer. PG tips is an English tea company and is one of the most popular in the market. However, the market is becoming flooded with many different tea producers. 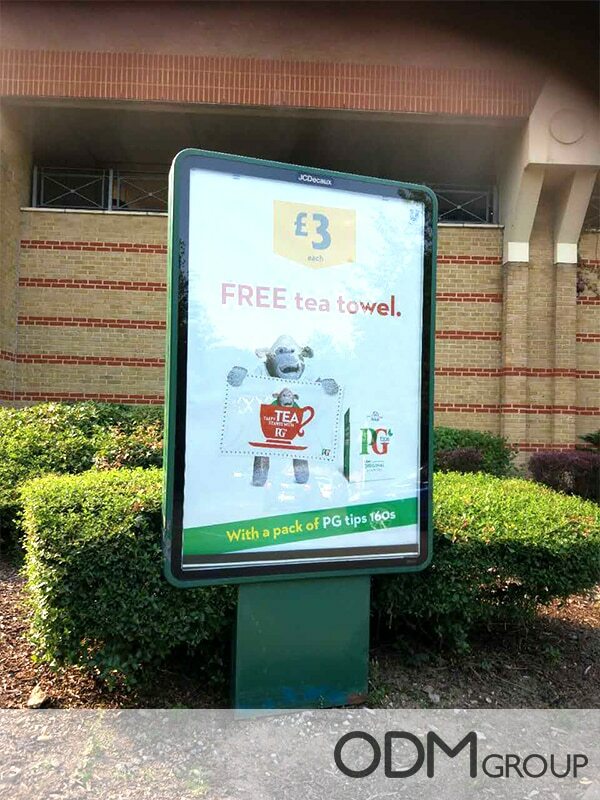 PG tips must stay ahead of the competition and find new ways to increase sales. A free item as practical as a tea towel is a great way to tempt customers to buy their tea. Additionally, by having their logo on the tea towel, PG tips are promoting their brand. That branding will continue wherever that free tea towel goes. Increased Customer Loyalty: A gift with purchase campaign is one of the most powerful ways for making your customers loyal due to the free gift. They will want to be aware of your new products all year long while awaiting new exciting promotions like this GWP. Boost Sales: In order to increase your sales, promoting a tea towel, especially a well designed one, will entice customers to come have a look at what you are offering. This valuable purchase will encourage more people to explore your other products. Increasing the awareness and purchases from your current range of products. Useful: When offering any type of product it is essential for it to hold and encourage use. Due to this, tea towels are an everyday used product and customers will appreciate receiving one. If you want more information about creating promotional tea towels, or any other marketing products, please feel free to contact us.